A woman who was found dead Tuesday inside a trash compactor near an upscale New York City apartment building — where Hillary Clinton’s top aide Huma Abedin and her estranged husband Anthony Weiner lived — fell down the chute while intoxicated, police said. Lara Prychodko, 48, was spotted on surveillance video stumbling alone out of the elevator on the Zeckedorf Towers’ 27th floor, the New York Postreported. It was not immediately clear how she got into the trash chute but a maintenance man discovered her body “crushed from multiple angles in the compactor,” the New York Police Department said. Prychodko and her husband David Christopher Schlachet split up after 13 years of marriage. She filed for divorce in 2014. The two have a son who is believed to be around 11 years old. She was a marketing manager for WebMD for about 10 years until leaving the company in 2013, according to her LinkedIn page. Schlachet did not immediately comment on his ex-wife’s death. A source who lives in the apartment building told the New York Post they saw Schlatchet and his son on Tuesday before Prychodko was identified as the victim. The source said the two were “acting normally.” No foul play was suspected in her death. Two people who live in the building where Prychodko and her husband used to reside told the New York Post it appeared Prychodko had a drinking problem. “She would come home drunk. Like, she couldn’t walk. I don’t remember a specific time, but I remember many times [more than once a week]…this was about three years ago,” a source said. 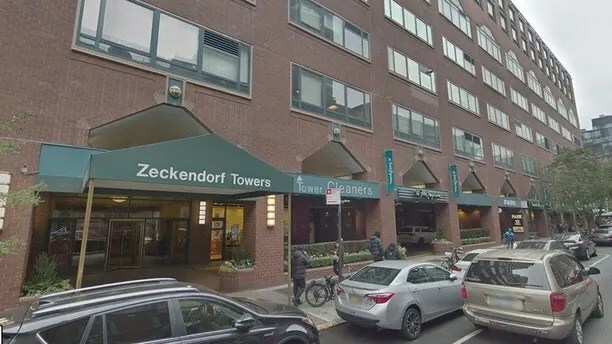 Several residents at the Zeckerdorf Towers told the New York Post they did not know her very well. Prychodko moved into the building about two years ago after splitting from her husband. “It’s just crazy. The building sent out an e-mail saying not to use the [trash] chute…What a terrible, terrible way to go,” a resident told the New York Post.